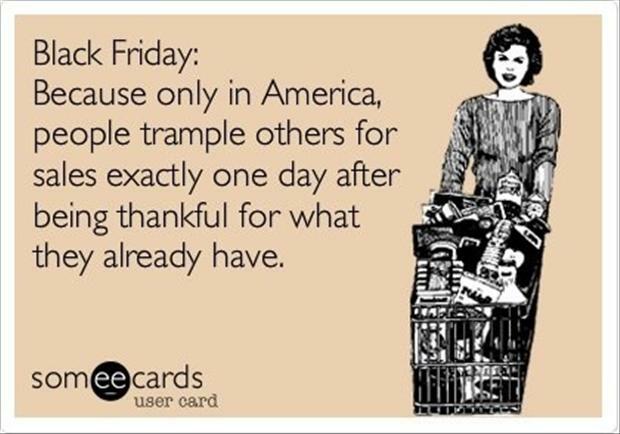 There are memes galore showing the dichotomy of the spending craziness of Black Friday as the follow up to the themes of Thanksgiving: appreciation, family, plenty. 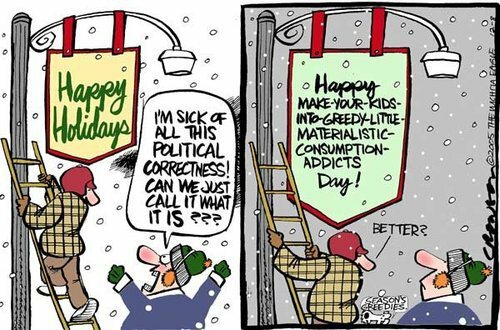 If you live like I do, you try to focus on one holiday season at a time. Let's face it: Corporate America doesn't! Christmas Ornaments typically compete for shelf real estate at the same time as Halloween decorations are up in department stores & novelty shops. 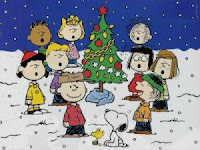 The rule in our house & my car (much to the chagrin of my teen) is no Christmas music or movies until after Thanksgiving. Well here we are, on the other side of Thanksgiving, and it's all open. 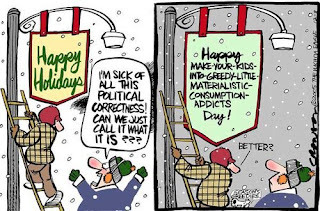 Black Friday marks the unofficial start to the shopping extravaganza called Christmas. According to the song, it's "the most wonderful time of the year." Or rather, the most "spending-est" time of the year. Black Friday sales followed up by Cyber Monday...and jingle sales, jingle sales, jingle all the way. Which leads to the next parody song: "Just Another Manic Spending Spree." In the spirit of Thanksgiving and all things First World, I look around, and what do I need? I truly have enough. Sure, the bank account could be padded more, we could go back to the days when the cleaning lady came (cut to provide for other priorities right now), maybe a massage, and a nice tropical vacation could certainly be calling my name. But what do I need? Black trouser socks. That's really about it. But, that won't cut it on the Christmas list. Then there's the kids' Christmas lists. Ei yie yie: holy guacamole! It's the time-old-trouble of teaching needs versus wants versus "enoughs." Plus, there's a lot of people who love my darling duo, so they need lists too. Next thing you know, a glazed look comes over the kids as they scour the Internet for things they feel they surely can't live without. I swear their pupils turn into dollar signs. Or probably those are little pupil-sized gift wrapped boxes in their eyes instead. Lots of them. I mean, they're kids. They love Christmas. It's a magical time. I get it. They don't have a full concept of money, and the greed thing just naturally comes to play when TV MarketLand is on the move, and all the techified whirly-gigs and gizmos cost a boatload each. But, it ultimately becomes "just more stuff." By mid-January, the newness always wears off. I think about the biggies that my kids wanted last year. When was the last time they even played with that stuff? At that point, there's just more "stuff" to manage. This 4 minute video from Films for Action entitled "Live Rich" does a nice job of poignantly showing the depth of the "stuff" that we manage as we get more "stuff." It does a nice job of dovetailing (inadvertently) on REI's #OptOutside campaign they had for Black Friday. #OptOutside was their movement to close all 143 of their stores to promote their passion & their mission--to get both their customers & their employees outside. What is the true price of the price you are paying for your "stuff" (Christmastime and all the time)? Can money even buy that? Cheers to each and every one of us for an intentional Christmas Season ahead. Get Thee Outside to a No Wifi Zone This Fall! Bill Nye's Nat Geo Explorer's "Meltdown"